Puts an end to the unsightly gap bet- ween the mainspring housing and the frame. These are the same flat, serrated housings Les uses on his own custom 1911 Auto pistols. Cast oversized, then finish machined for a tight, gap-free fit on all commercially-available 1911 Auto frames. SPECS: Steel, blued or stainless steel, matte finish. Plasserer en slutt til stygge gapet bet - ween hovedkilden bolig og rammen. Dette er den samme flat, taggete hus Les bruker på sin egen tilpasset 1911 pistoler-automatisk. Cast overdimensjonert, deretter ferdig maskinert for stramt, gapet uten passform på alle kommersielt tilgjengelig 1911 Auto rammer. Spesifikasjoner: stål, blånert eller rustfritt stål, matt finish. This is a very nice MSH. The rails on the MSH were a little over sized and needed to be dressed down with a fine file, but I consider this a plus. It does exactly what it says and closes the gap between the grip safety and the MSH making a very nice finished appearance. Poorly made casting. After filing to fit found the holes do not line up. Expected more from Les Baer. I thought that the other reviews were probably from someone that fit the part wrong. After all, it is a Les Baer, it must be good right? Wrong! It is a poorly made casting full of voids and blemishes. There is no need to even try to fit it. I would need to file the serrations again to get all the casting voids out. Les Baer must be one heck of a 1911 maker to be making them out of these parts. It is even worse in person than in my picture. Buy an Ed Brown, his parts are better. 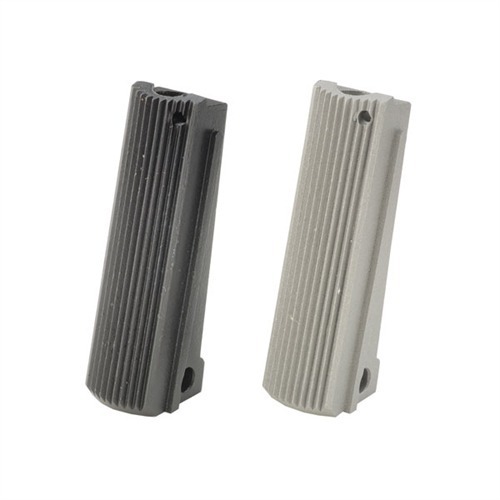 I wanted this serrated housing for my 70 series Dan Wesson. I was trying to give my modern pistol a more traditional look like the old war time Colts . This piece dropped right in. It looks great on the pistol and feels great in my hand. As mentioned in other reviews, there are areas on the part that almost seem unfinished like they forgot to bead blast it one last time. The blemishes on my part are extremely minor and unnoticeable unless inspected closely. It's a shame other buyers have not gotten similar results because this could really be a great piece for a custom touch. I still love mine, but if I were building an expensive custom pistol, I may try my luck elsewhere. What give Les Baer? 1.) Mainspring retaining pin hole in mainspring housing was misaligned with frame hole in three different high-end frames. I was able to fit one with a fine rattail jeweler's file and a lot of careful work, but the other two went back to Brownells. 2.) Rough casting...several blemishes, gaps, etc. The housing to frame fit is perfect. The mainspring housing pin hole on the one I received was not in the correct place (slightly off) making it impossible to install the pin (without over sizing to hole). Not sure how to review this. The fit was very tight about half way into the frame. I simply pushed the housing back and forth into the frame until I could see where it was rubbing and proceeded to file with an ignition file. I noticed that the inside edges of the housing was where material needed to be removed leaving the blueing on the visible edge of the housing to stay intact. It ended up being a lot of filing more toward the top half sides of the housing to get it to make it all the way into the frame but it made for a gapless fit. The hole for the pin didn't line up with my series 80 Colt locations. Had to redirect the hole in the housing with a small rat-tail jewelers file. Looks and feels great on the gun but a lot of work to get it there. It gets 4 stars because it seems that this is the only old style, original looking new part available in a flat housing. I can't believe Les Baer put his name on this piece of junk. I had to butcher this thing with a file to get it to slide into a Colt frame. It still wasn't even close to fitting a Springfield frame. It looks terrible because I had to file so much of the finish off. After all of that the hole for the retaining pin did not line up to the frame. The hole is hugely oversize but was off so much that the pin would not go in. It is going into the trash. It looked well-machined and all that, but my experience was the same as other reviewers. Was not "drop-in" and took about 45 minutes of filing, sanding, losing some bluing before it finally fit into the frame. But then, the mainspring housing pin would not go through the frame because the hole was not aligned, and was too far off after drilling and filing. Then bought an Ed Brown and it was perfect-- no filing, no sanding, no stress and was installed in less than five minutes. Installed this in my M1991A1 Colt to replace plastic factory housing. Plastic housing and trigger were put away for emergency replacement if needed. (Also fit a Harrison Design & Consulting 1911 Long Black Trigger.) Les Baer Housing was tight. A little oil and playing with it by inserting then removing it did the job. Still tight but fits fine. Retaining pin was a little tough to get in. I am not sure if it was off center like stated in the other reviews as I didn't think it was. Eventually the pin went in after inserting and removing it several times using oil. It looks and functions fine. I did all the function checks as I am a Colt armorer and the weapon passed. Have yet to shoot it. I would not recommend this for someone not used to fitting parts. If your looking for a drop in housing than keep looking. If you want one that will fit like a glove after being properly fit then this is the one. I put this in my new Caspian build and it fits better than any housing I have ever used. It will take some fitting, but the end result is well worth it. Great product. I specifically chose the Les Baer MSH because I knew it was oversized and I could fit it the way I want to. So no issue there. However inside where the main spring goes was so rough that you could feel the plunger dragging when you pull the hammer. After at least two hours of trying to clean up the inside with a dremel it is still to rough to put on a custom pistol. Will not buy again!! After reading the previous reviews I expected fitting to be required. The housing is an almost exact match for the plastic one in my recently purchased 1991 Series 80 Colt. Once the old one was removed and the mainspring swapped over (took about 2 minutes) it was obvious the new one was oversized. I used a vernier caliper to compare the sizes of old and new. Old was about 13.6mm wide and new about 13.9mm. Using a straight fine mill file I carefully took the matt cast finish off the 4 flats which resulted in a width of about 13.7mm. A little more filing on each flat brought the width back to 13.6mm. It was obvious the raised locating ridges were also too wide so I brought them back to the same width as the original. The housing now slid part way into the frame. Using a candle I blacked the shiny surfaces and kept trying the housing and used a fine flat needle file to dress the places where the black rubbed off until the housing slid all the way home. As expected the hole was a touch out but a small round needle file soon had it matching the hole in the frame and the pin inserted. A bit of cold blue finished the job although the filed parts are not actually visible. The results are a perfect fit of a quality steel part that looks identical to the original plastic one. Produsentnr. : LBCP2050 Plasserer en slutt til stygge gapet bet - ween hovedkilden bolig og rammen. Dette er den samme flat, taggete hus Les bruker på sin egen tilpasset 1911 pistoler-automatisk. Cast overdimensjonert, deretter ferdig maskinert for stramt, gapet uten passform på alle kommersielt tilgjengelig 1911 Auto rammer. Produsentnr. : LBCP2050SS Plasserer en slutt til stygge gapet bet - ween hovedkilden bolig og rammen. Dette er den samme flat, taggete hus Les bruker på sin egen tilpasset 1911 pistoler-automatisk. Cast overdimensjonert, deretter ferdig maskinert for stramt, gapet uten passform på alle kommersielt tilgjengelig 1911 Auto rammer. Tufnut Media 7 lb. "Easy Pour Container"